The only difference is that they aren't buying AquaNet by the case to make what my wife and I call Wall Hair. 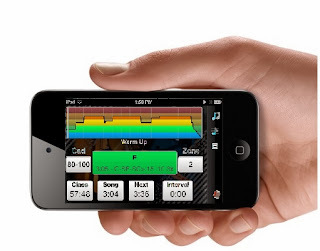 Normally I show the heart rate chart of my profiles, but instead I thought I would show you a picture of what it looks like on your iPod/iPhone when you're coaching with the Class Builder™ app, since I find it such a powerful tool. I never have to mess with paper notes, my instructions are displayed right in front of me, along with several timers so I can improve my cues. Additionally I bought (from ebay for about $11) an adapter cable that allows me to display my profile on a big screen television in my Spinning studio. The participants have commented how helpful it is to see the heart rate profile as we proceed thru the ride, giving them a heads up about breaks and hill intensities. Are you Tough Mudder Tough? this is something very much informative and new to me as a beginner Spinning instructor. Very glad to hear there is some digital help out there. However, my concern is that apart from the US many European countries are still Android friendly and me personlly I do not store my music in iTunes and have never used an iPhone. Honestly speaking I do not even intend to. Do you know any substitutes of the tools you presented here for non iphone friendly instructors? Iwona, Sorry I had responded via mobile and just noticed that it didn't post. Here in the States the fitness industry is very heavily bent towards iOS (Apple products), even though personally I am an android fan. That means that the Class Builder app is not planned for migration to the Android platform. Prior to my use of the Class Builder app, I was only interested in two features beyond the regular music players, one was the ability to overlay a metronome tone for cadence drills, and the other was for crossfade of the music. I'm sorry but it's been more than 2 years since I was looking at Android solutions so even if I had found a good solution for either of these, I'm sure that it would have changed by now. Fyi, I do use my iTunes with my Android phone. I use iTunes to manage all my library (18,800songs) because it works so easy with the iPod touch (that I only use for Spinning class), and then I use a program called iSyncr to put the same playlists on my Android phone for my personal listening. Sorry I'm not more help. Stay Frosty!